I localize software. You can send me your exe, html, xml, etc. files in English or German and I will render them into Czech and send them back to you. I can localize general user applications (like MS Security Essentials) as well as highly specialized software such as software for production machines or agriculture, etc. I translate texts (manuals) that deal with production machines such as industrial robots/machines made by KUKA, Winterhalter, Klingelnberg, and other manufacturers. HDDs/SDDs, motherboards, computer memories, LCD flatscreens, printers, scanners, etc. I translate them all! Video game consoles, mobile phones, tablets, MP3 players, refrigerators, washing machines, microwaves, you name it - I translate them all! Your language professional since 2007. I translate texts specialized in information technology / production machines from English / German into Czech. Send me your document written in English or German and I will render it into Czech and send it back to you. 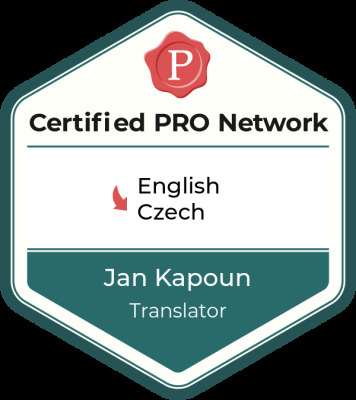 You can then use this document for your marketing and documentation needs targeted towards Czech speakers. 1) You send me your files. 2) I analyze them and inform you about the wordcount and target price. 3) I translate the files. During the translation process, I always try to provide the highest quality possible. This is why I might have questions regarding unclear or ambiguous terms. Please note that although I am a very specialized translator, your text might not provide enough context to choose the best term. By asking questions, I make sure the target text is as accurate as possible. During the translation process, I use a number of tools - CAT software, quality verifiers (e.g. XBench), technical dictionaries and special productivity tools. 4) I send the files back to you along with an invoice. Please note that the key point here is specialization. You want to work with a specialized translator with the underlying experience and education. Why? Because such a translator knows the context, knows the terminology, and works faster, because he knows most of the terminology by heart.